Digiwave RG6211000B 1000-feet RG6 Coaxial Cable is professional-quality cable with 18 gauge copper clad steel center conductor. Cable also swept-tested to 3000MHz(3GHz) to assure excellent off-the-reel performance. This cable heavily 60% shielded with 100% foiled to minimize interference. Copper clad steel conductor maxima the cable length you can run. Cable jacket is sequentially marked to keep track of cable used. Digiwave RG621025BF RG6 Coaxial Cable is professional-quality cable with 18 gauge copper clad steel center conductor. Cable also swept-tested to 3000MHz(3GHz). This cable heavily 60% shielded with 100% foiled to minimize interference. Copper clad steel conductor maxima the cable length you can run. Cable is ready for use with F connector installed. Use to connect the 75- ohm coaxial output from your cable box, television, VCR or satellite dish / receiver. This cable has been swept to 2400Mhz (2.4Ghz) exceeding all industry standards.Perfect for extending or shortening existing cable runs between video components. Wire Data, Ethernet and Computer network connections with the Southwire Company 1000 ft. Blue 23/4 CAT6 CMR Riser Cable. This cable features a low-smoke PVC jacket and 4 pairs of copper conductors. Blue colour. 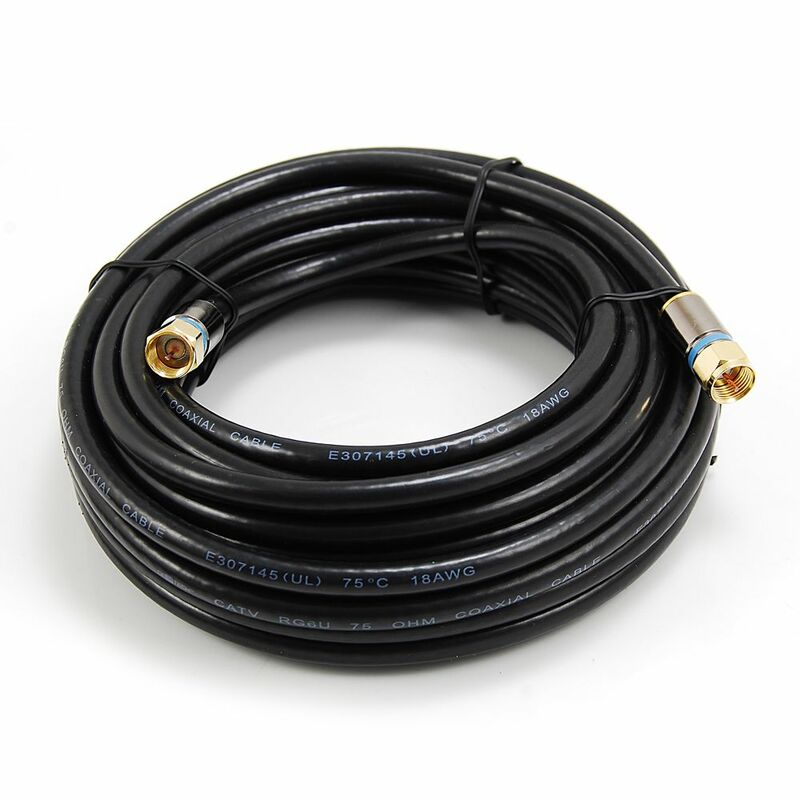 25 ft. RG6 Coaxial Cable in Black The RG6 coax cable is used for CATV-community antenna television and VCRs and CCTV-closed-circuit television. It uses F-plugs to connect on both ends. It features low-loss, double shielding which ensures less interference in your picture and sound. 25 ft. RG6 Coaxial Cable in Black is rated 4.5 out of 5 by 22. Rated 5 out of 5 by veetuch from High quality wire at a cost that was reasonable when you consider it had the ends already attache... High quality wire at a cost that was reasonable when you consider it had the ends already attached. I was a cable installer and found this product to be great for my DIY project.